The White House has refused to supply Ukraine with arms or grant it the status of special strategic NATO partner in the military sphere. However, Washington promised to continue providing political support to the country and allocated $53 million in financial assistance. Ukrainian President Petro Poroshenko’s visit to the United States has ended without the achievement of its chief goal: being officially recognized as a special non-NATO ally to the U.S. The White House declined to award Ukraine this status and also refused to supply Kiev with weapons, though it promised political and financial support. In the opinion of Russian analysts, although Poroshenko’s visit to the United States did not culminate in a great achievement, it will ensure the broad support of the Ukrainian establishment in its confrontation with political opponents inside the country. “We confirmed that we will support Ukraine and provide the country with additional assistance in the areas of economics and security,” said Obama. According to Poroshenko, the U.S. is prepared to give Ukraine $1 billion in financial guarantees and render Kiev additional support in the amount of $53 million, $46 million of which will go into funding the state army and $7 million of which will be transferred to international organizations that will provide humanitarian assistance to the victims of the domestic conflict. The Ukrainian president also proposed that the United States Congress create a "special fund for the support of investment by American companies" in Ukraine. Poroshenko stressed the need for intensifying military support for his country. "We urgently need more military equipment, both lethal and non-lethal," he said in his speech to Congress. However, neither the congressmen nor the U.S. president supported Poroshenko’s bid to obtain more weapons, stressing Washington's intentions to provide non-lethal weapons only: body armor, night vision devices, communications equipment, vehicles, patrol boats, clothing, and medicines. The U.S. authorities also announced that they do not intend to provide Kiev with the status of ‘major non-NATO ally’. 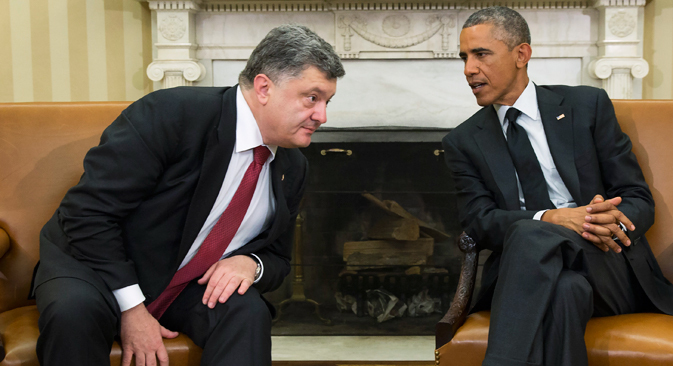 "President Obama told me that the level of cooperation between the U.S. and Ukraine in the sphere of defense and security is much higher than that which corresponds to the United States’ cooperation with major non-NATO allies, for example, with Argentina," said Poroshenko during an interview with CNN, explaining NATO's motives. At the same time, in a speech before members of the Atlantic Council, he made it clear that Ukraine is not asking to join NATO, but only "out of politeness." "Poroshenko's speech was certainly very successful,” said Fyodor Lukyanov, chairman of the Council on Foreign and Defense Policy. “He received the public reaction he had counted on. He spoke a very smart English, which is essential for the positive perception of foreign leaders by American society. However, the U.S. made no legally binding promises to protect Ukraine," he said. As Lukyanov noted, Washington took very modest steps towards assisting Ukraine: Poroshenko did not receive any large-scale economic or military support. “Poroshenko was promised support and pressure on Russia, and Kiev was effectively left to solve its internal problems on its own,” added Lukyanov.